The British Orthodontic Conference took place in London at the end of September. The event was attended by over 1200 delegates and the theme of this years’ conference was Ortho 360 recognising the important role orthodontics plays in the multi-disciplinary treatment of dental patients. The conference had a number of parallel lecture programmes aimed at orthodontists, therapists, nurses and practice staff making it a tough choice each morning as to which lectures to attend. There were many occasions when I wanted to be in more than one place at the same time so tried to attend a wide selection of lectures to both reflect my role on the Patient Panel and my interests in blogging about orthodontics. The main clinical programme had lectures from well known and influential people such as David Birnie, Prof. Martin Cobourne, Prof Kevin O’Brien, David Sarver, and Prof Jonathan Sandler. The lectures covered a wide range of topics including the diagnosis and retrieval of difficult impacted teeth, impact of obesity on tooth movement, integrating TAD’s into Invisalign treatment, TMD patients, craniofacial development, and dental trauma. The other lecture programmes included topics such as NHS contracting and tendering, consent in orthodontics, generational psychology, and the use of orthodontic therapists. Each lecture was well attended and everyone I spoke to, enjoyed the quality and variety of the programme. In addition to the lecture programme, there were a number of skills workshops covering lingual braces, developments in the use of Invisalign, dental photography, functional appliances, and bonded retainers. These were delivered to smaller groups of delegates and focussed on hands-on skills development. There was also an exhibition supported by many of the well know names in orthodontics including Invisalign and 3M. I was able to spend some time with a few of the exhibitors learning more about their products and will be writing articles over the coming months about a few new interesting products that caught my attention. One area of the conference that I always try and spend time in is the poster exhibition. This is where academic posters are displayed summarising research work that has been undertaken on different orthodontic related topics. Again, I will be using content from these to publish more articles in the future. Overall, it was a fascinating and extremely busy conference with time spent catching up with colleagues from within the profession and collecting content for new posts throughout the year. 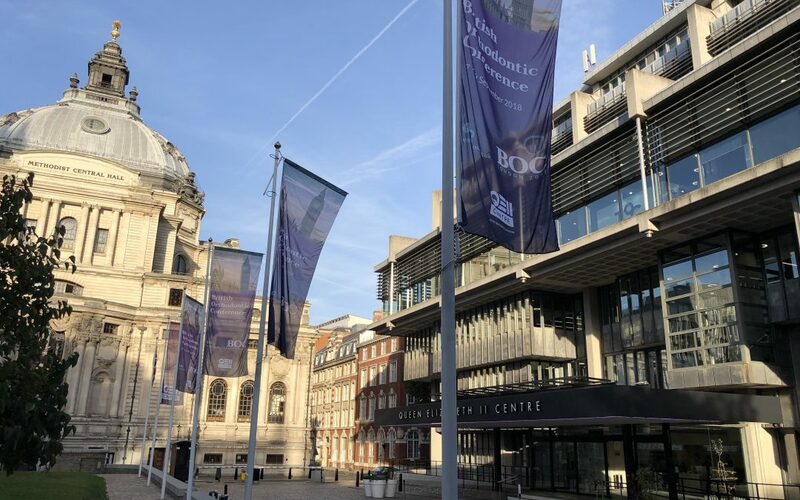 A huge thank you to the British Orthodontic Society for extending an invitation to attend the conference and to the organising committee who put together such a fascinating and varied programme. The 2019 conference will be held in Glasgow on 19th – 21st September.